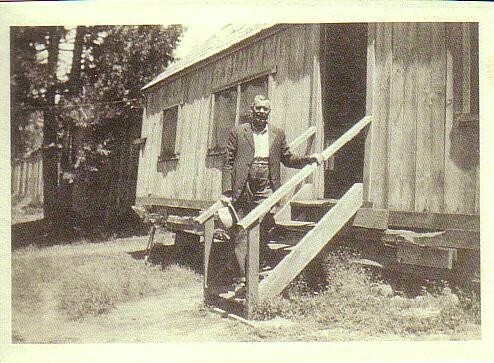 The Museum was given a number of interesting photographs from a variety of locations throughout California, but mostly in the Tuolumne County area. The donor was Loren Lacy from Tuolumne County. His family was involved in logging there and some of the photos depict his family. Converse basin as it looks today. Back to the 36 ft. diameter tree immediately after being felled. 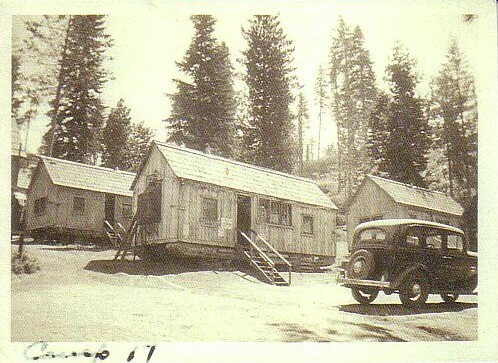 View of Camp 17, a part of the Yoseimite-Sugar Pine Logging Operation As you can see this must have been in the late 20’s or early 30’s. Camp 17 Note cabins are built on skids so that they can moved as needed. Another photo of the Yosemite Sugar Pine RR or more likely the Madera Sugar Pine Lumber Company (Sent to us by Elaine whose family worked in that operation.) Click to enlarge. The operation is the Madera Sugar Pine Lumber Co. The cars are Carter Brothers flats and the white board on the sides of the cars were warning placards for anyone riding the train and were unique to the MSP. Some good photos of the cars and placards are in Hank Johnston’s book “Thunder In The Mountains”. Their operation was very close to the Yosemite Sugar Pine’s south side operations in it’s early years and probably led to Elaine’s error. Her family members may even have worked for both since they were such close proximity. Thanks. John. Also, if this had been the YSPRR, the cars would have had the massive bulkheads at their fronts to prevent the logs sliding off the cars when they were going down the incline at El Portal. The 78% incline required drastic steps to keep the logs on the cars. See Don Haldeman’s comment later. This is Crocker Ridge, and that’s the Yosemite Sugar Pine Railroad, but you’ll have to draw your own conclusions as to the rest of the story. 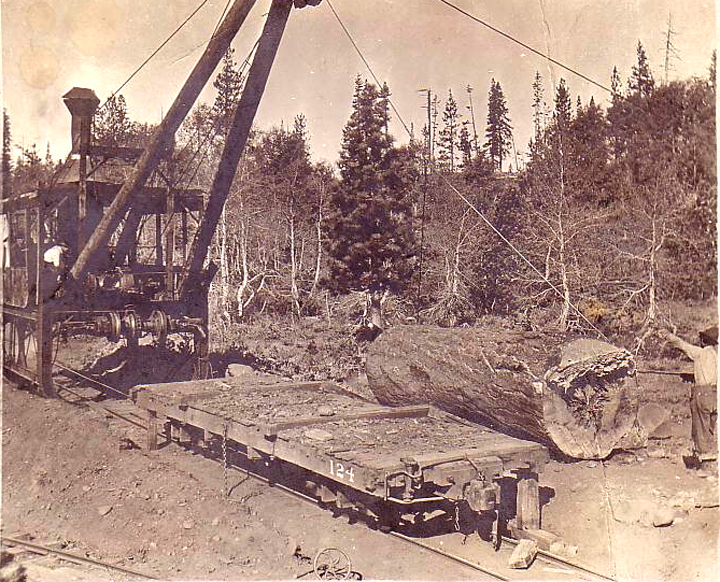 This photo of the McGiffert Loader was taken near Hobart Mills, California, north of Truckee. 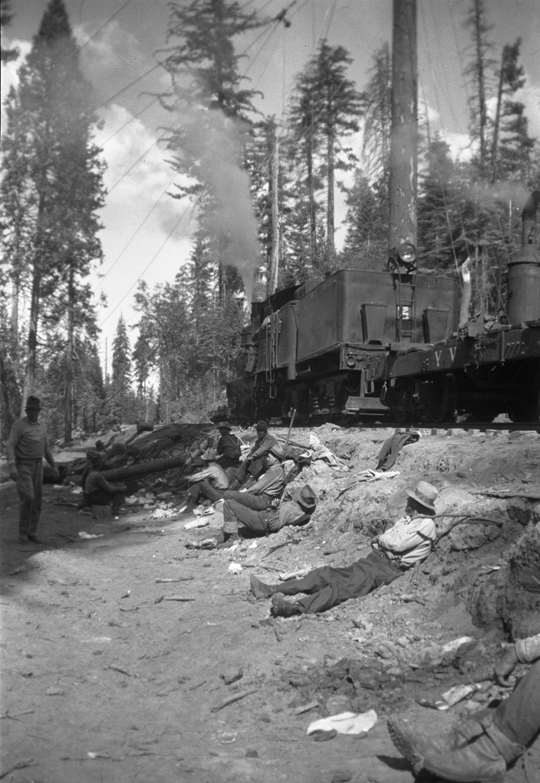 The narrow gauge railroad shown was operated at that time by the Sierra Nevada Wood and Lumber Company. The SNW&LCo operated out of Hobart Mills from the late 1890’s until about 1936. Thanks, Paul, for the information. Here’s another photo of the McGiffert loader in action. Sent to us by Paul who said, “Don’t know who took the photo, but would guess it was Mr. George Oliver, Superintendent at Hobart Mills. He was an avid photographer. Note the rail line is a 3 footer. (Click on photo to enlarge) Paul also sent us a line drawing of the loader, if anyone is interested. The next two photos (below) are not related directly to any of the other photos, but too good not to post somewhere. I’ve written before. 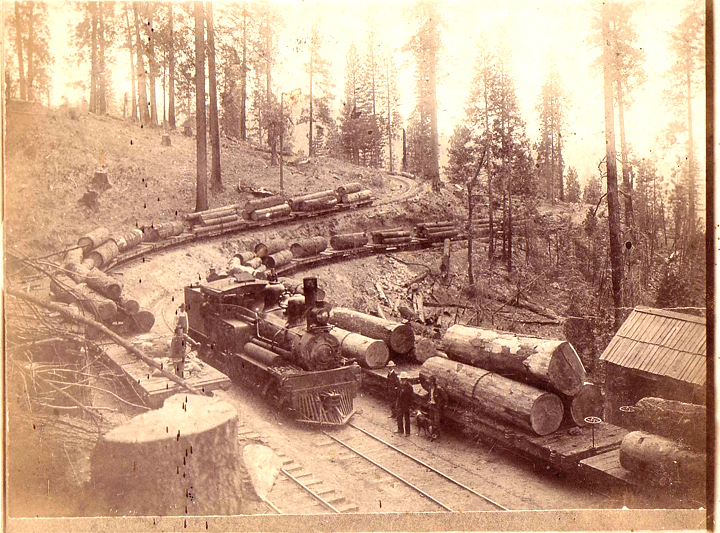 I am interested in old logging photos from Tuolumne County, particularly those that might reveal information about the Empire City Railway which ran from the Lyons Transfer Station to the Empire City Sawmill and the Cold Springs Sawmill on the North Fork of the Tuolumne River. Please let me know if you have any photos that will help in my research. I will be in Tuolumne County in June of 2009 and willl come to visit your museum. I’ll call first to make sure that I know your operating hours. 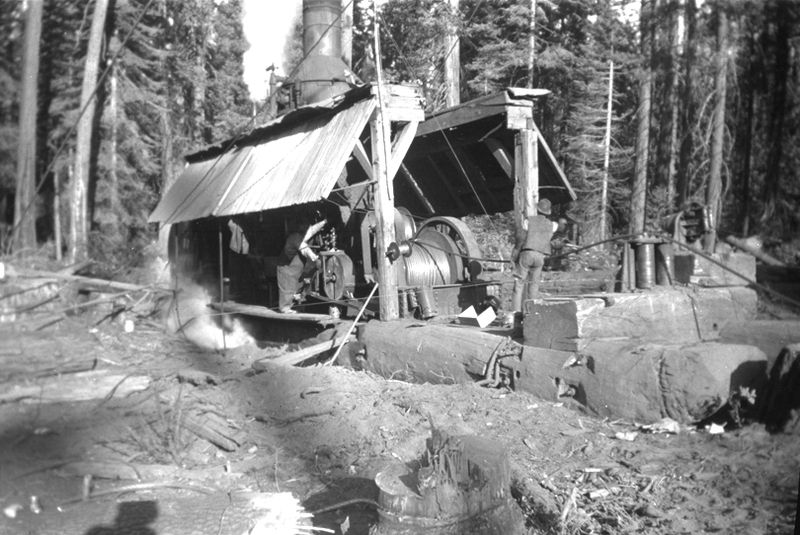 The “Steam Donkey moved by rail” was not on the Yosemite Sugar Pine operations. 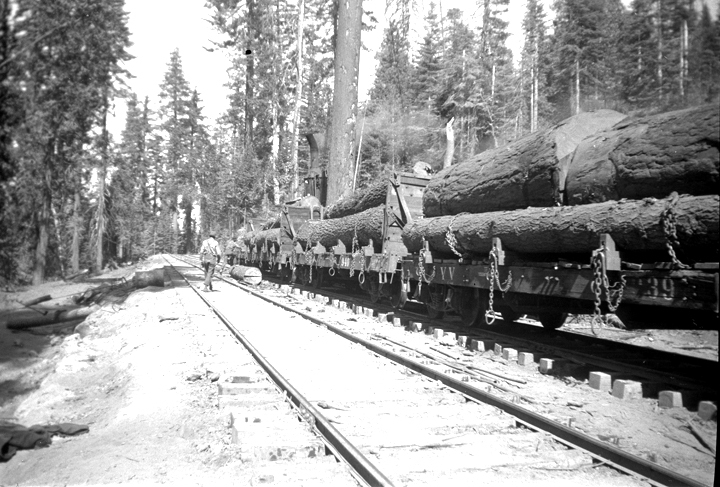 The log cars, supplied by the Yosemite Valley RR, all had bulkheads to prevent the logs from shifting while descending the very steep incline into the Merced River canyon. Some items of note: 1) The brake wheel has been removed to prevent damage during loading. The wheel is lying on the ground. 2) Some of the corners of the car have been blocked to prevent the car from tipping during loading. 3) One or two more empty cars can be spotted under and behind the loader then rolled or pushed into postion for loading. 4) Two ramp planks are against the side of the car and the cables have been set so that this log will be rolled on to the car. You, Mr. Haldeman, are a much keener observer than I, at least when it comes to railroad stuff. Thanks for your observations. I followed them all. on March 12, 2009 at 5:09 pm | Reply grace. Thanks Joseph, every kind word makes my work more pleasurable. What kind of specs you need ? What donkey winch manufacture you working with ? Willamette, Washington ? What time period of operation ? assuming gas power early 50’s ? email me some photos and Im sure I can help. Would this be the Mike Figone that Graduated Santa Rosa High School in 1985? 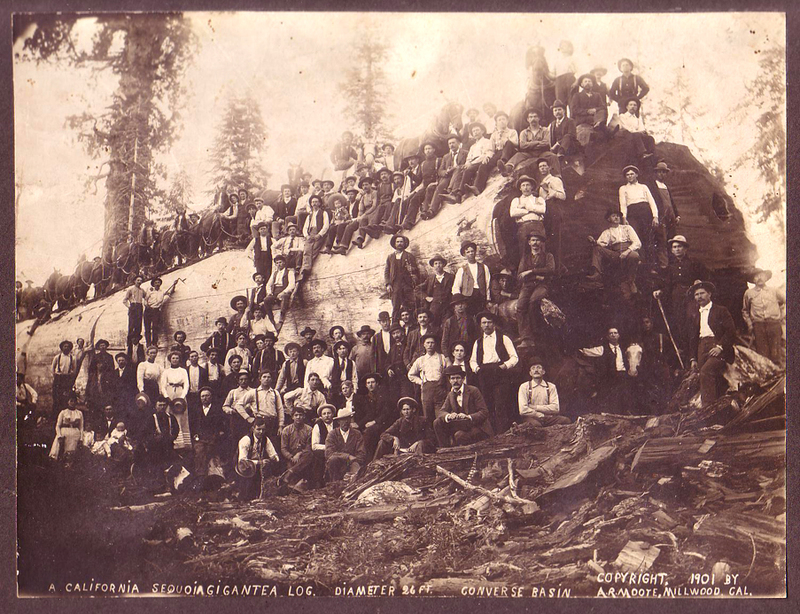 The photo of the McGiffert Loader mentioned above (“We don’t know for sure where this picture was taken, but it appears to be earlier than our Crocker Ridge photos”) was taken near Hobart Mills, California, north of Truckee. 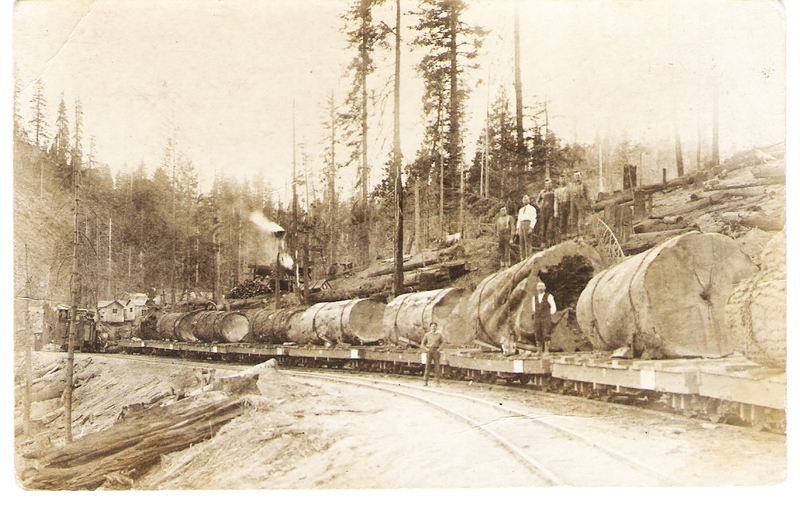 The narrow gauge railroad shown was operated at that time by the Sierra Nevada Wood and Lumber Company. The SNW&LCo operated out of Hobart Mills from the late 1890’s until about 1936. I’ve put that information as a caption under the photo. Thank you, David. All compliments are noted and appreciated. But, to our credit, corrections are noted and appreciated also. I have a feeling that this might be a serious question, if not, no big deal. A steam donkey consisted of a huge boiler that made steam that drove an engine much like steam drove the engine on a steam locomotive. The engine drove big winches (huge cables on drums) that could move huge logs wherever they needed to be. The winches could also move the very heavy steam donkey from place to place. The picture of the steam donkey higher up on this page can be enlarged by clicking on it and you can see the various parts. Also the McGiffert loader on this page is a kind of steam donkey. I found an old photo very similar to the first one on your site w/roots and lots and lots of men sitting on it-could it be an original? Are there any descriptions of the subject or other indications of where it was taken? None, just that it looked similar to your first one. The lady that had the photo was from Maryville, Ca-so I was clearing her estate and just wondered. I suspect that it is an original copy. What I’m saying is that they sold photos of special things much like postcards, and there might well have been thousands, or more, printed and sold. I might not know for sure even if I saw your print, but certainly can’t answer definitively without seeing it, if then. 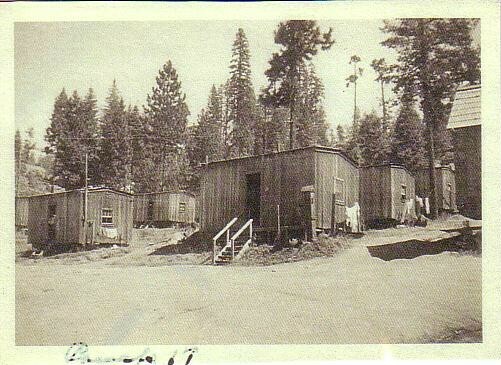 Looking for information on Camp 9 logging town along Stanislaus River in Tuolumne County California..I do know this was a Sierra Railway logging town and a earily hydro-electric powerhouse along the Stanislaus river. All records for the Sierra Railway were burn in a fire during the Newell fire of Jamestown California 1912. The Sierra Railway crossed the Stanislaus River at Melones coming down from Tuttletown. This would have been a number of miles west, or downriver, of Camp 9. I’ve not re-researched it, but in my memory and experience Camp 9’s only purpose was the generation of electrical power. The location was ideal because they could bring the water to a forebay high above the river and drop it in penstocks down to the generators. It was not a location suitable for a logging operation. I looked briefly for a map of the route but didn’t locate one. How much did a lumberjack make working at a logging camp? Well, the answer to that question depends on a lot of factors. What years? What job? Where in the country? 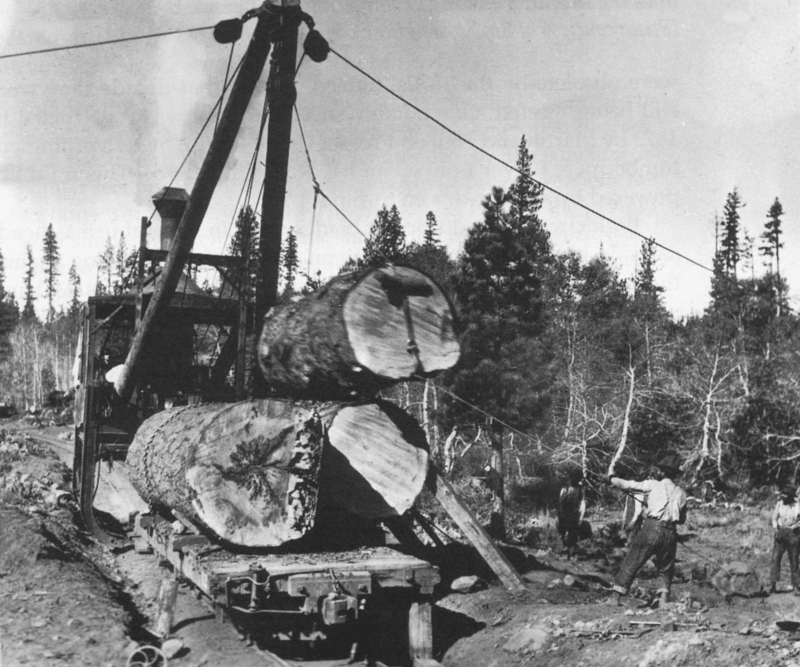 During the 1930’s, the highest paid employee in the logging industry was the logging mill’s sawyer. He made about $6 a day. Everyone else made less. Many of the “fallers” got paid by the number of board feet that was in the trees they were falling. I think a fair guess, and it is only a guess, would be that during the 20’s and 30’s an average wage might have been around $1 an hour. I thoroughly enjoyed viewing the photos and reading the comments on your site. I have added this to my Favorites. One note: Elaine’s photo credited to the Yosemite Sugar Pine operation and the editor’s note as possibly West Side Lumber Co. are both in error. The operation is the Madera Sugar Pine Lumber Co. The cars are Carter Brothers flats and the white board on the sides of the cars were warning placards for anyone riding the train and were unique to the MSP. Some good photos of the cars and placards are in Hank Johnston’s book “Thunder In The Mountains”. Their operation was very close to the Yosemite Sugar Pine’s south side operations in it’s early years and probably led to Elaine’s error. Her family members may even have worked for both since they were such close proximity. Thanks John for the correction. I have no doubt you are correct and have made the appropriate changes. We pride ourselves on our exhibit of the El Portal Incline, and if I had looked closely enough at Elaine’s photo, I would have known those were not Yosemite Lumber Company rail cars. I’m interested in finding out about the name Paper Cabin Ridge in touloumne county calif. I am too, Susan. Why don’t you contact the USFS office in Sonora. I recently went on a jeeping trip with a friend who took me to what he called “Billy Dew” meadow logging camp. We took a dirt road just outside of the south entrance of Yosemite and wound around for about an hour before we got there. My friend said that this was where the logging turnaround was, and that this is where the loggers got to “relax” for awhile. There are three small log cabins and an outhouse still standing. Supposedly a saloon, a store and a brothel. We found the remnants of what looked like some sort of steam engine or a donkey engine, and what I thought might be a cistern. If you have any information, I have lots of pictures of the remains of this camp. I know nothing about this camp, but your post was very interesting. Could that camp have been in Madera County? 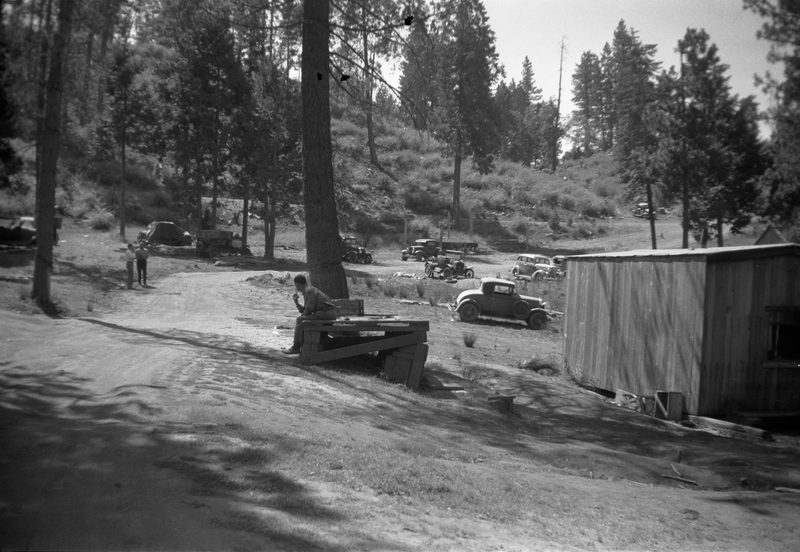 For the most part, the old photos we have from Tuolumne County are already on the web site. Contact the Tuolumne County Historical Society. They have maybe thousands of historical photos. view it that is good written, fast to comprehend. I congratulate you for this article that I am going to recommend to people friends. can find results gpa levels. Have a great day!